It's our CAMERA!!!! No waaaaaayyyyyyyyy! I'm going B A N A N A S! Can you believe it? I can hardly believe it! (Click here for the full story, but the short version is that it was left on our first flight on our way home at the end of our Europe trip). 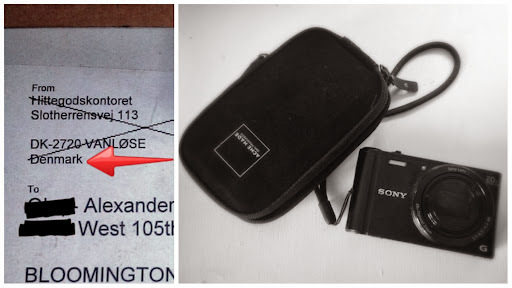 After 41 days, this package from Denmark arrived with our camera inside- camera, case, memory card, and all of the memories I thought I'd never get to see again. After contacting SAS Airlines and the Coopenhagen police via email multiple times and two failed 2:00am international calls to the Copenhagen Police, I had pretty much given up hope that we'd get it back. While on the phone we were told that they didn't have a camera turned into the lost & found that matched our description. I waited a week and gave one more 2:00am call to the police a shot and heard the magical words "we have an item on hand fitting that description & matching serial number." From there we did a wire transfer to cover the shipping cost, gave our address, and just waited hoping it would arrive in one piece with a full memory card. None of the process was easy at all, but I am so, so, so thankful it's here at last with every beautiful memory still there! Yes, I did have my iPhone pictures but there's about a thousand more moments on the camera, maybe some I've even forgotten about? I can't wait to find out! I was so geeked that I just had to share the excitement but I'm going to start sifting through all the photos and videos now! See ya! Oh PS- I've gotten a few emails from people asking how we planned our multi-city Europe trip or other tips, so I'm thinking about writing up a post with that info- sound good? Would you be interested in that kind of post if I did? Let me know! My Fall "Seasonal Fashion Confusion" and a Shabby Apple Giveaway! Pick a Dress!